8' x 100' Fine Mesh Fiberglass Screen - Sliding screen doors, screen frame, porch screening, window screens. 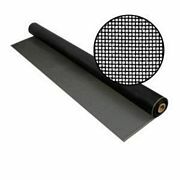 8' X 100' Fine Mesh Screening to Control Tiny Insects (20x20 Mesh). This Fiberglass NoSeeUm screen is a tightly woven mesh designed to control small insects. While densely woven, this screen still allows good ventilation and visibility and provides some daytime privacy.